Diggers Valley: 14 December 2013. The week beginning the 14th of December 2013. 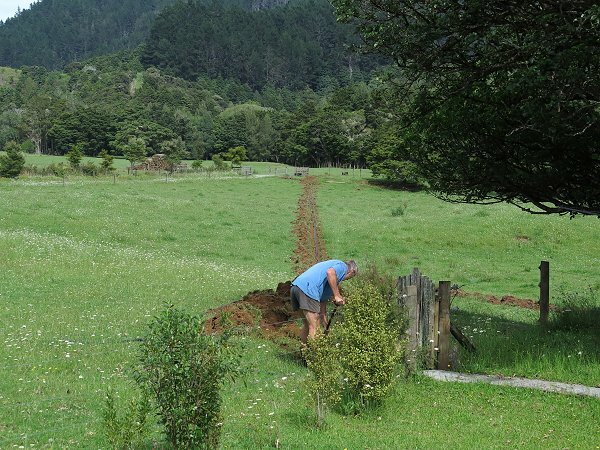 Today Stephan laid the water pipes in the trench and dug carefully around the Puriri tree's roots at this end near the garden gate. 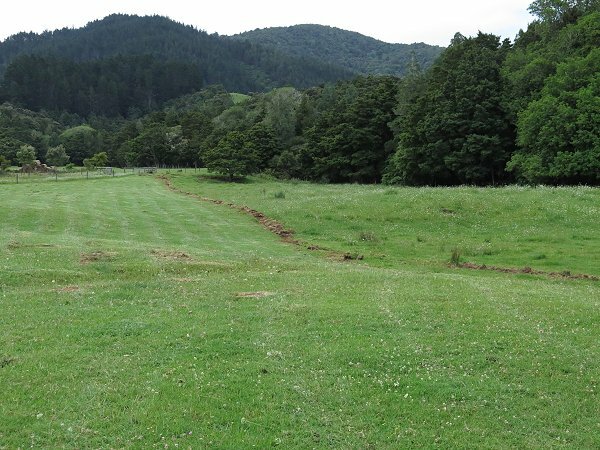 The trench is straight and appears so from this angle, but from other points it looks wildly crooked, because of the little hillock in the middle of the paddock. Lance came out to help Stephan with the fence in the Big Back South. In the evening Stephan went across to move some of the cows for me (I'm still disabled by my leg wound) and Lance travelled on the back of the ute so that when they saw some rabbits, they'd stop and Lance could attempt to shoot them. I hobbled up the stairs to the best window in the house, from where one can see the whole of the flats. (It's a bit dusty in the afternoon sunshine, the result of all the logging trucks now going up and down the road.) I'd seen some probable heat activity amongst the cows earlier so Stephan, with his radio, had been my remote observer of the cows, so we could try and figure out who I might have seen. I think it was one of the twins and one of the older, blacker cows, with a bit of white on her udder. It doesn't really matter at this stage, but it can be helpful later to have noted when the cows are on heat early in the season. My mother, Jill, came up on this morning's plane. 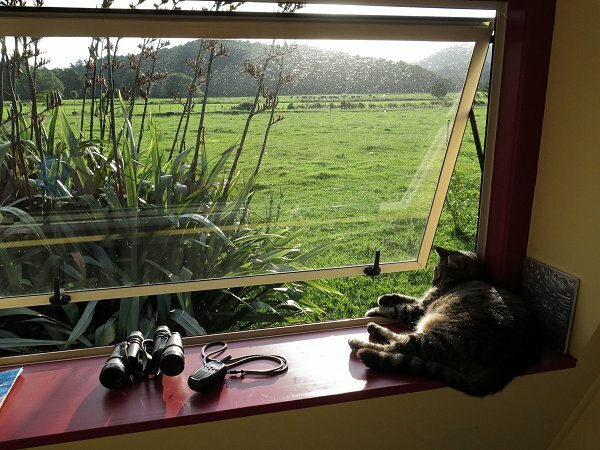 I bought her a cheap-ish ticket a while ago in preference to having her travel on the bus, because the bus trip requires a connection at Kerikeri and last time she came that way, she missed it and we had to go and find her. Air New Zealand are much more careful about their passengers than Intercity Buses ever are. We got into the car (I'd borrowed Jane's, since Stephan was off in the ute for the day) and drove around the carpark to leave and realised with alarm that I had the close company of a bee, which promptly stung my leg as I pressed down on the brake pedal! Fortunately there was no other moving traffic near me and my slight swerve didn't connect us with a near-by parked car and I leapt out of the car and dislodged the sting. The bee walked off across the tarmac to die. I hate stings because I find them very painful and my body reacts quite strongly to them. Having planned to go to the doctor's surgery for a dressing change on my leg, I asked them if they'd give me an antihistamine pill, since I hadn't brought my own with me, which they kindly did. Now I limped on both legs. 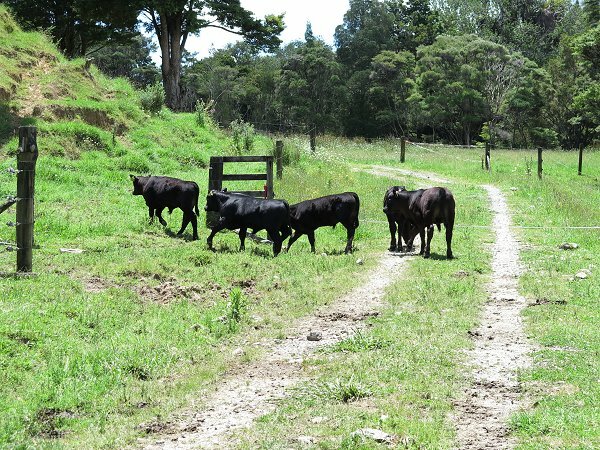 Feeling a little more comfortable today, I took Jill in the ute out to go and move the mob of 20 cows and their calves from the Pines to the PW. These five calves had been lying quietly under the trees by the stream and were slow to follow the rest of the mob. I strung the tape gate across the lane under the (invisible in the picture) spring gate, to discourage them from ducking under the spring and going along the lane, then went and got the calves. 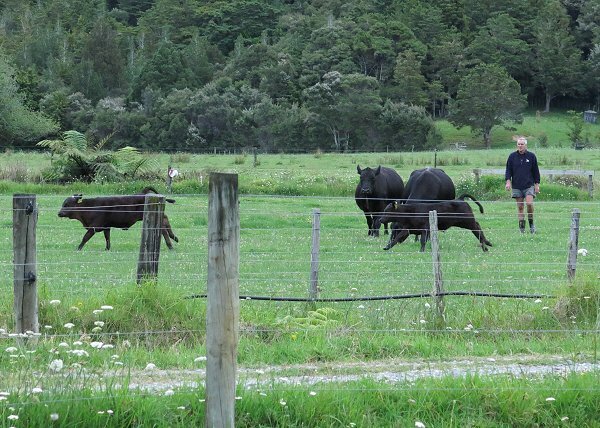 At around two months old, they're now behaving much more like proper cattle, rather than silly calves, so they stopped at the barrier and eventually looked to the opening I wanted them to go through, and went. 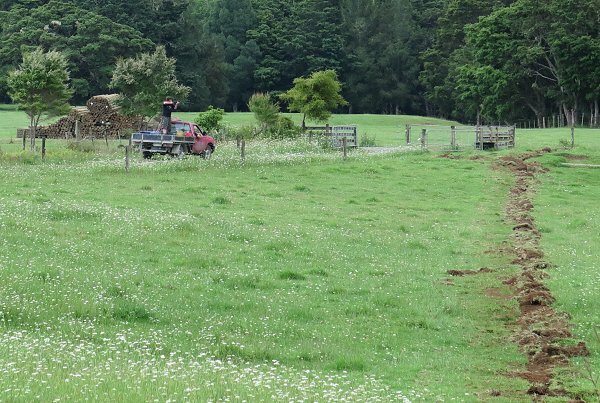 This afternoon Stephan drove home on the tractor with a big grin and a bow, indicating that he and Lance had put the last of the posts in for the Big Back boundary fence and wired it up so that it is secure enough to contain cattle. The battens still have to go on and that'll be another big job. Nailing them on by hand is physically testing, so Stephan intends to do it bit by bit. Because it's exacting work, he doesn't particularly want to delegate to his young helper - once a batten is on, it's hard to get it off again if its positioning isn't right, without damaging the fence wire. Battens have to be carefully placed, or they'll ruin the appearance of the whole fence. 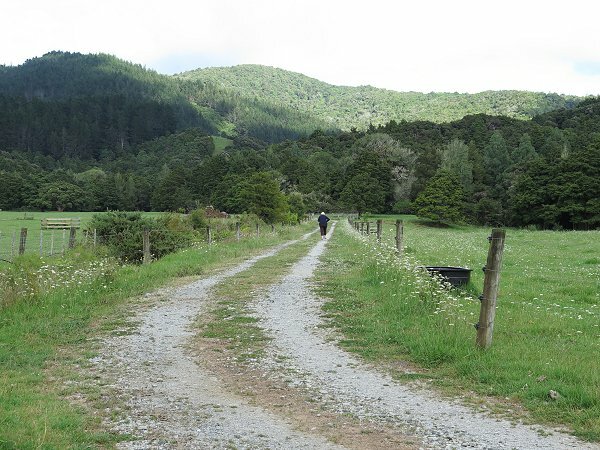 I've been sending Jill off for walks on her own along the farm tracks, thinking she's safer here than on the road, both because of the absence of large trucks which might knock her down, and other people who might ask her confusing questions. It's hard to gauge how much confusion she now suffers, but having noticed a couple of years ago that she couldn't remember which way she'd just come and which way was home, I'd say it's quite serious. In Auckland she has "carers" who come and take her out for walks around the streets. At present I'm not up to long walks. Stephan mowed some of the House Paddock this evening. While it looks quite green and lush, there's not much good feed in the area to the right of the new trench. The earlier-mown paddocks are now thickly covered in clover flowers, which is very encouraging. Zellason and Brozella go mad in the evenings when it's time to come in, sometimes making getting them in a little tricky. 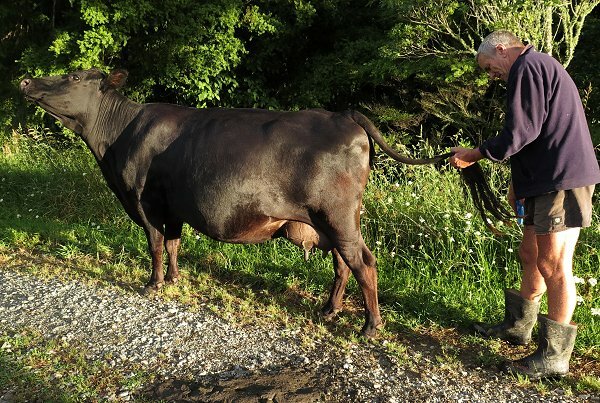 But the two cows are so used to the process, that they're usually a steadying influence. If they get silly as well, the whole lot of them take off up to the top corner and it takes ages to get them all settled and out through the gate. While picking some roses this evening I noticed this Kikuyu, which has grown up some gap in the little tank-stand shed, to reach the light at the top. It's a fascinating plant. A piece like this used to grow in the kitchen, where it had found a way through the wall. It eventually gave up, when I kept pulling it out. 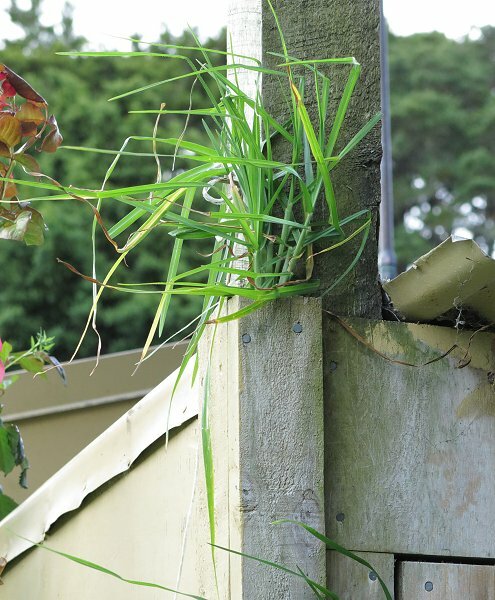 In my greenhouse, Kikuyu grows up the insides of the walls and through the window-sills. 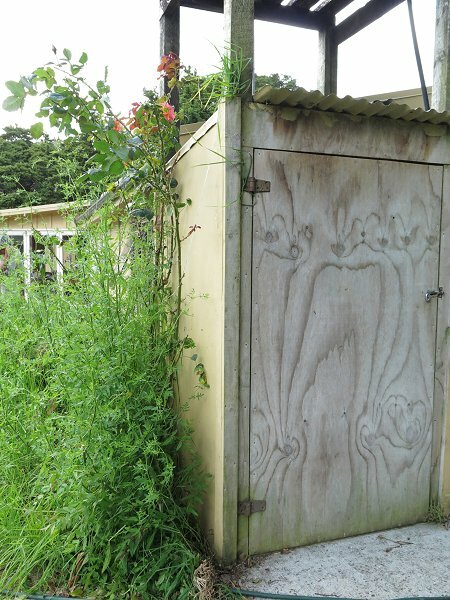 It can cause problems if not removed, because the stolons can become extremely thick and tough, pushing wood and even concrete apart. 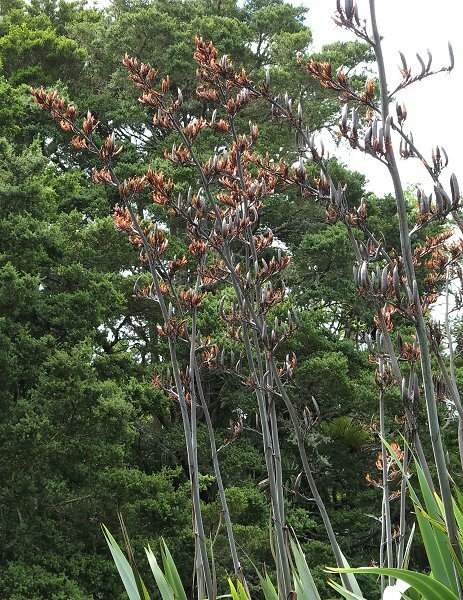 The flax flowers at the back of the house are now transforming into the dark brown seed pods. Tui are still regular visitors and there are always lots of bees. I'll try and collect a lot of seed this year and sow more around the farm. The cattle really enjoy eating flax, so that wherever it pushes through a fence, it's all frayed and chewed. Some say it's a good remedy for their internal parasites. There are still babies all around us. 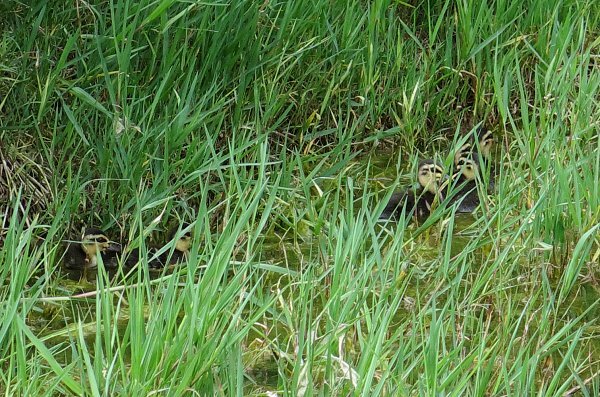 Down on the pond a Mallard duck has been seen a couple of times with her second clutch of ducklings for the season. 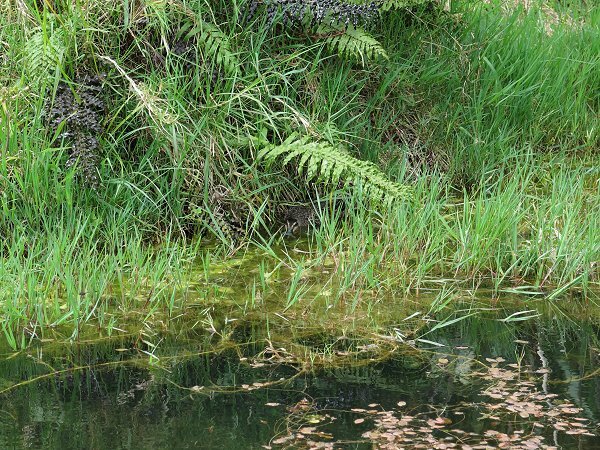 She tried to get them away from me as I approached the pond, but there being nowhere to go, she hunkered down in the cover of the grass and fern on the edge of the island. This is an enlargement of the centre of that picture. 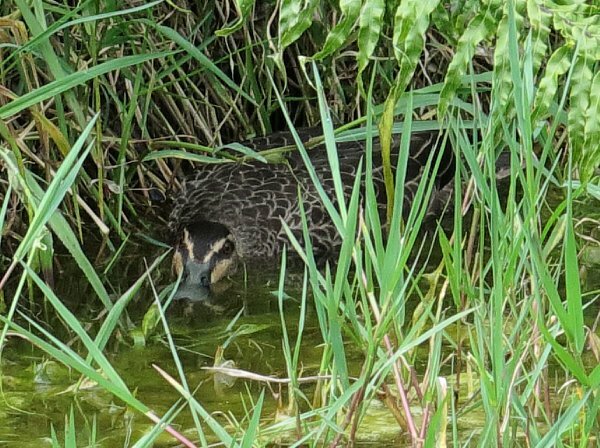 The ducklings must be behind her in the grasses and she has her head so low that her bill is in the water up to her nostrils. She remained like this, completely still, until Finan came down the steps onto the deck and she could bear it no longer. 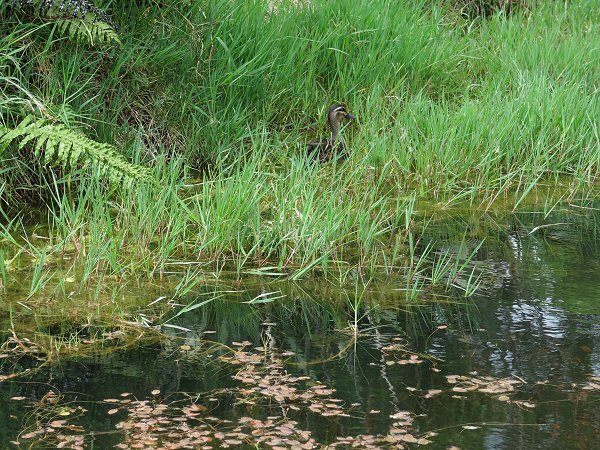 She quickly swam away around the island, leaving her ducklings. A few seconds later they emerged, also making their way quickly to follow her. Once out in the open, they took off as fast as they could. 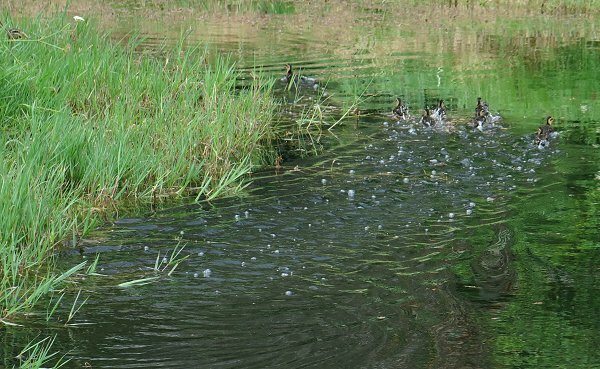 Little ducklings use feet and tiny featherless wings to get across the surface of the water at great speed. They're so light, that they probably almost run across the water. Zella was standing in the sunshine looking lovely, so Stephan grabbed a brush and rubbed it up and down the back of her udder where there are a lot of ticks (I haven't yet put a second dose of the tickicide treatment on her but as it has a nil withholding period for milk, I probably should) and then attended to her tail. Cows and sheep will hold their heads like this when their rear ends are being rubbed. They very obviously enjoy the grooming. I had the six stitches out of my leg today, a surprisingly painful experience. They were under high tension and my skin had become quite irritated by them. By the end of this evening, with a little paracetamol on board, I was feeling a lot better again. I'll have to take a bit of care over the next week or so, and keep the skin strapped together to prevent it all stretching into an uncomfortable scar.